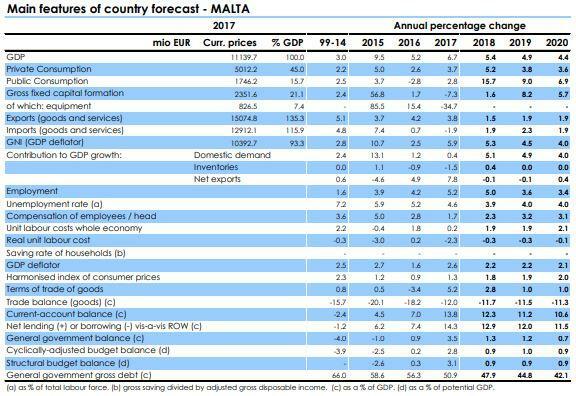 Malta’s strong GDP growth is set to continue as domestic demand replaces net exports as the main engine of economic activity, according to the European Economic Forecast for autumn. The report says that the internationally oriented services sector continued to underpin the large current account surplus and inflation was expected to pick up as wage pressures started to gain pace. The government balance was projected to moderate but remained in surplus. The report says that GDP rose by 6.7% in 2017, driven by strong growth in net exports. In the first half of 2018, real GDP growth slowed moderately compared to 2017. Private consumption growth accelerated, while net exports declined as a result of rapid import growth in the second quarter. Business and consumer confidence indicators remained high and real GDP growth was expected to average 5.4% in 2018. Growth was expected to gradually ease over the forecast horizon to an annual average rate of 4.9% in 2019 and 4.4% in 2020. Domestic demand was set to be the main driver of growth, supported by strong investment growth. Various investment projects co-financed by EU structural funds would boost public investment in the second half of 2018. In 2019, the onset of largescale projects in the health, tourism and real estate sectors was expected to boost private investment. Private consumption was set to remain dynamic, on the back of increasing labour market participation and disposable income. Export growth is expected to slow down over the forecast horizon in line with the projected moderation in global demand, while imports were expected to rise, driven by investment growth. The current account balance was set to remain at historically high levels, underpinned by the large external surplus of the internationally oriented services sector. Inflation was set to progressively rise over the forecast horizon on the back of wage growth, and should reach around 2% in 2020. Government surplus was projected to decrease to 1.3% of GDP, from 3.5% in the previous year. Tax revenue growth was expected to be lifted by high nominal GDP, supported by favourable macroeconomic and labour market conditions, high corporate profits and consumer demand. An expected fall in the proceeds from Malta’s citizenship scheme compared to last year should contribute to a decrease in the fiscal surplus. Current expenditure was projected to be dynamic in almost all components, only partly mitigated by decreasing interest expenditure.